Raspberry Pi Wiimote Paint #piday #raspberrypi @Raspberry_Pi « Adafruit Industries – Makers, hackers, artists, designers and engineers! People have done some cool stuff controlling Raspberry Pi robots with Nintendo Wiimotes. Now I don’t have any robot bits, but I do have an old Wii sitting unloved upstairs, so I found the remote, put batteries in it and started to think about what I could do. 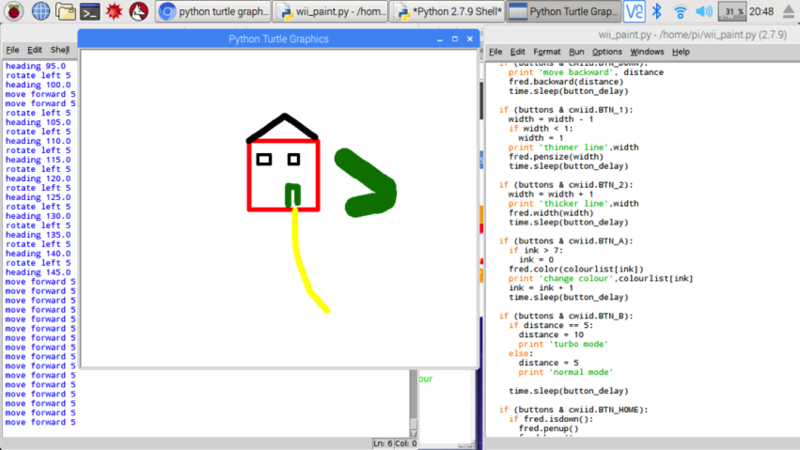 I can’t drive a robot, but I can drive a turtle – a virtual Python graphics turtle. So I made a paint program that is controlled using a Wiimote. I based the code on the excellent example on the Raspberry Pi Spy web site – Python code below.